Now is the time for you to comment, post your opinions and participate in keeping the dialogue going. Together we can make this and on-going discussion and keep the energy flowing. Arnait Media Productions is sponsoring this blog thanks to the support of the Canada Council for the Arts. Sheila Watt-Cloutier gave the daily inspiration words on September 14th, the opening day of the Symposium. 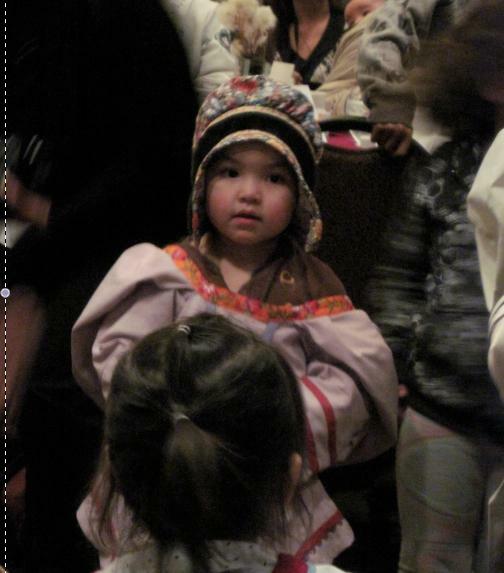 As she was not able to be in Iqaluit, she shared a video communication which we reproduce here. She talks about what it is to be a leader, especially for a woman in Nunavut. In Inuktitut and in English. Last week was amazing. Women from different communities met in Iqaluit and share stories that will give you chills, make you laugh and empower you. They had different visions, interests, opinions and belonged to different political groups. We recorded about 50 stories you will find them here on the blog. A testimony from the heart; Edna Elias, Commissioner of Nunavut, talks about her path, how she became the Commissioner and the people who are supporting her. A very lively Manitik Thompson shares her values, her stories, her experiences as a minister in the NWT and the passage to Nunavut. A powerful story ! In English. Presentation by J.Okalik Eegeesiak, President of QIA. In Inuktitut and English. "The books gathers the reflections of eleven Inuit women who have taken the risk of leadership in Canada and beyond"
Edited by Louis McComber and Shannon Partridge.This edition was a limited one for the Symposium; the official print comes in a few weeks. Essential reading for who wants to understand how Nunavut feels from the inside. Honourable Rona Ambrose, federal Minister of Status of Women and of Public Works, came for a one day visit to Iqaluit. She receives a copy of the book "Arnait Nipingit" Voices of Inuit Women in LEadership and Governance from Martha Aupaluktuk-Hickes. Susan Pameok, from Rankin talks about the changes she wants to see in Nunavut for families and social changes. In English. Marianne Issakiark talks about violence against women in Nunavut: "As women we have to stand up and say this has to stop." Marianne Issakiark from Arviat talks about violence against women in Nunavut: "As women we have to stand up and say : this has to stop." In Inuktitut. Susan Pameok from Arviat, now in Rankin Inlet talks about the changes she would like to see in Nunavut for families and social services. In Inuktitut.